The true secret of this dish is its speed and stylish simplicity. The salad needs to be made just before serving as the tomatoes degrade quickly once they’ve been sliced. If you’ve been storing the tomatoes in a fridge let them reach room temperature before you start working as the cold kills their flavour. Cut the tomato slices about half a centimetre in thickness. 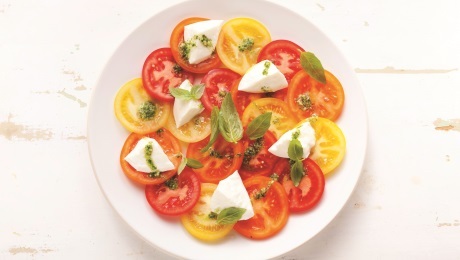 Arrange neatly on the plate so the diff erent coloured tomatoes overlap. Tear the Mozzarella and scatter over themtomatoes. In a small bowl or cup loosen the pesto with olive oil until it has a drizzling consistency and then drizzle over the dish. Give is a twist of black pepper and a scattering of sea salt. Top with the basil leaves and serve immediately.